What is the Prison Industrial Complex? and What is the Context for Today’s Prison Industrial Complex? What is the Prison Industrial Complex? maps out the relationship between the many forces which profit from and influence prison growth and the increasing criminalization that fuels it. What is the Complex for Today’s PIC? maps an historical shift from the modern Welfare State to a “carceral” state, in which order is achieved less by assuring the needs of communities and individuals, and instead policing and imprisoning the behaviors of survival, rebellion and illness that grow from inequality, as the state’s function shifts from care to force, apprehension and detention. 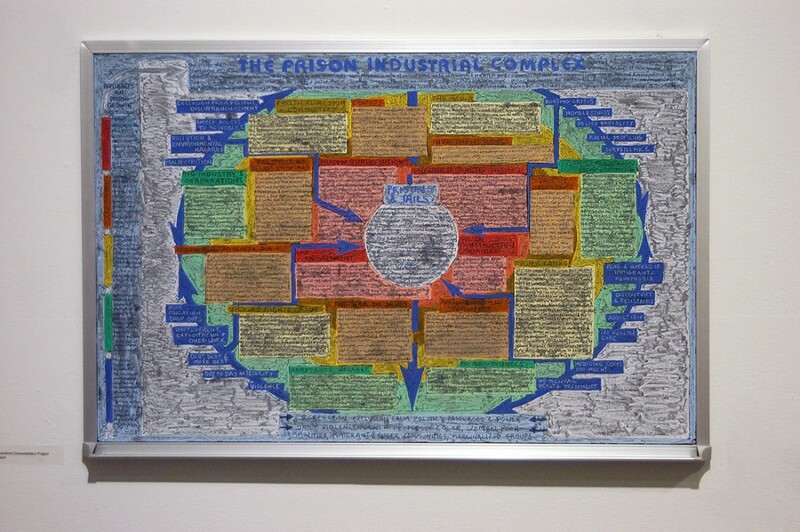 Both maps are made from a surplus of information and research accumulated in the production of the many pieces of the Corrections Documentary Project, but which cannot fit neatly into a photograph or video, lending instead abstract visual representations to the complex workings of a growing and distributed system.